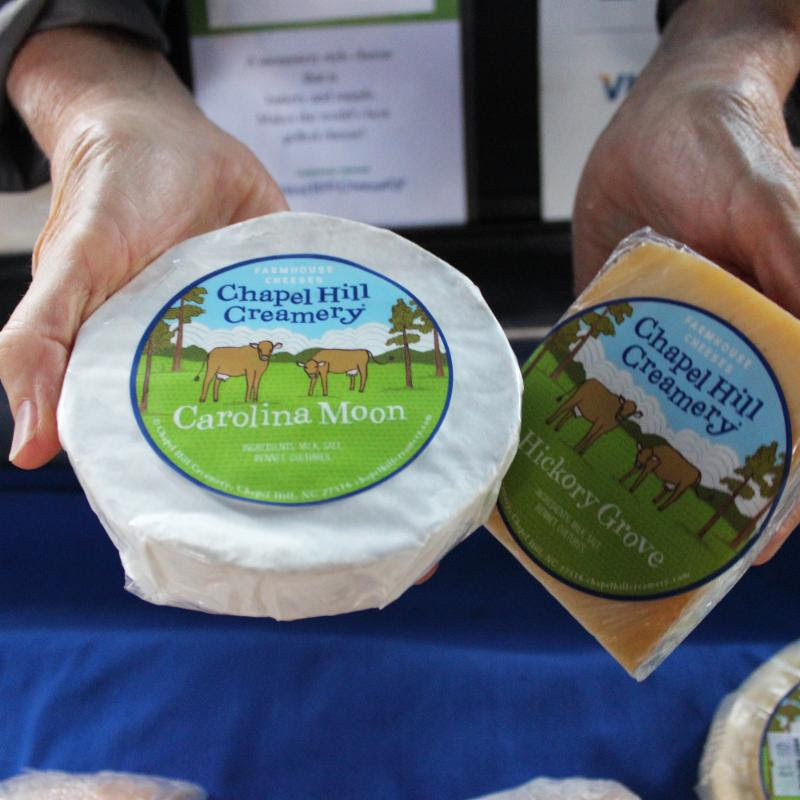 Chapel Hill Creamery has made a variety of award winning cheeses since 2001. We use the milk from our registered herd of 30 Jersey cows at our farm in Orange County, and the rich milk from this breed enhances the distinctive flavor of our cheeses. Portia McKnight and Flo Hawley, who own the creamery, grow cool and warm season grasses so that the cows can graze on fresh grass as much as possible with rotational grazing. We consider our cows a part of the team and the herd is Animal Welfare Approved. We are members of Orange County Living Wage and have a wonderful staff of 10 full and part time employees. We sell a core group of fresh and aged cheeses throughout North Carolina and the southeast, with a few more available seasonally at the market. Our cheeses have won awards for many years including awards at the American Cheese Society Competition, the Good Food Awards, the N.C. State Fair Competition, and the World Jersey Cheese Competition. We are happy to give samples as well as serving or cooking suggestions at the market. We sell whey fed pork including a large variety of mild and spicy sausages as well as flavorful ground beef. The whey from our cheese making is fed to pigs on our farm and this nutritious part of their diet makes the meat tender and delicious. We choose the spice mixes and use the hams as well as trimmings to produce delicious sausage.